Sgurr Mor is the highest mountain in the group known as the Fannaichs, which lie to the N of Loch Fannich. It occupies a central location and its high ridges link others in the group. 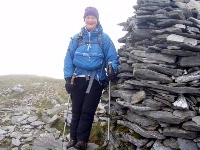 The summit is a steep cone with rocky corrie which occupies most of its NE face. This is generally a steep sided mountain but with rocky out-crops on its N slopes only. 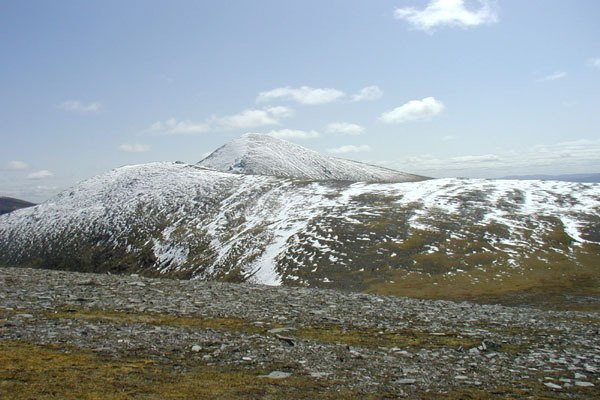 Sgurr Mor has three ridges, NW to Carn na Criche (961m) giving access to Meall a' Chrasgaidh and Sgurr nan Clach Geala, SSW to Meall nam Peithirean leading to to Meall Gorm, and finally NE to Beinn Liath Mhor Fannaich. Sgurr Mor behind Carn na Criche taken from the beallach between Carn na Criche and Meall A'Chrasgaidh. Sgurr Mor with Carn na Criche in front and Beinn Liath Mhor Fannaich in the left distance viewed from the top of Meall Chrasgaidh. 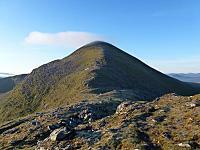 The summary information of one or more ascent routes that include Sgurr Mor [Loch Fannaich]. 1 1198 m 19.43 km 6 hrs Sgurr Mor [Loch Fannaich], Beinn Liath Mhor Fannaich and Meall a' Chrasgaidh Moderate route. How about that ! 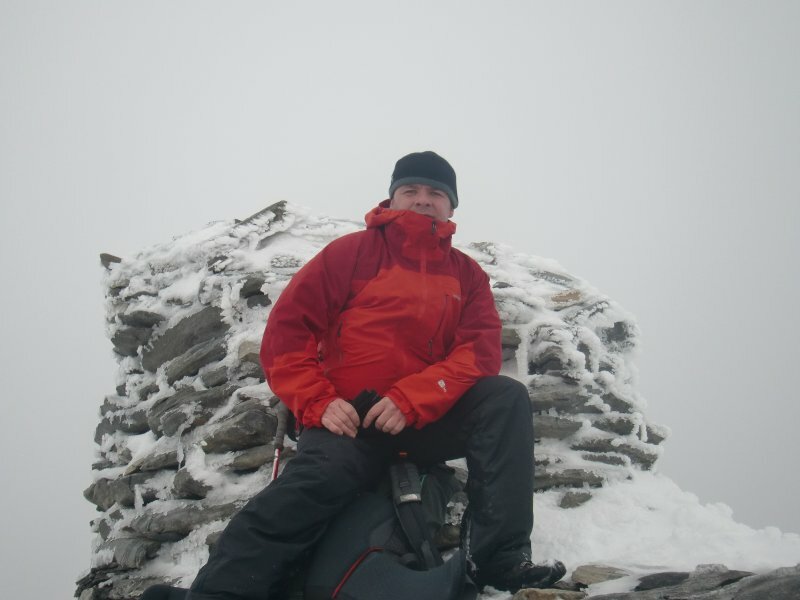 I never even noticed the broken septre till looked at the photos :-) 3rd summit of 6. 20th June 2012. 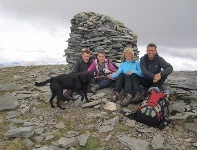 At the summit cairn, Stephen, Rachel, Jan and me with Bonnie raring to get to the next one, just wish I had the same amount of energy ( and speed) Nice to get a good dry spring half-term week in many years of going to Wester Ross. 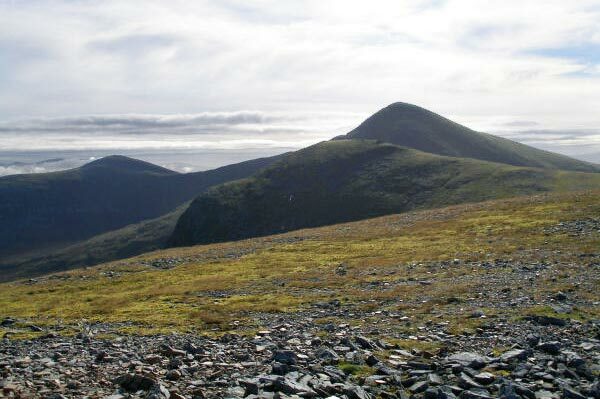 Post a few words about Sgurr Mor [Loch Fannaich] or read what others have had to say. 2nd of four Munros of the day. 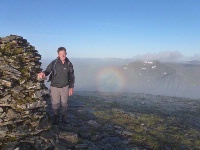 Excellent visibility all around, very warm, hardly a breeze on the first two summits, which seemed to please the midge! Walked in from Loch Droma taking in Meall a' Chrasgaidh, Sgurr Mor [Loch Fannaich], Meall Gorm and Beinn Liath Mhor Fannaich. This is a great walk with breath taking views all around you. The only down side is tracking back from Meall Gorm towards Sgurr Mor to pick up the ridge across to Beinn Liath Mhor Fannaich. Still lots of snow around be especially careful on the top of Sgurr Mor as a snow cornice has developed, keep close to the cairn. A stunning mountain with lofty stance at the hub of the complex Fannich ridges.